If you have ever travelled back to Perth along the Great Eastern Highway there is every chance you have stopped off in Bakers Hill for a pie or sausage roll. The shop is an institution of modern-day folklore that you would otherwise miss as you hurtle through a blink-and-you’ll-miss-it town of just over 1,000 people. But if Bakers Hill has gained notoriety for its pastry delights then one of its best-kept secrets lays hidden just a couple of hundred metres away at the golf course. For almost 40 years Bakers Hill has run a junior golf programme that is the envy of any other. It recently earned deserved national recognition, when Bakers Hill was named the MyGolf Centre of the Month for July, but for those in the region the selfless philanthropy of the club’s junior co-ordinator Suzanne Waters and coach Dave Cockman are well established. Their philosophy is simple – make golf as accessible as possible for children. That has primarily entailed opening up the course to kids on Saturday mornings and providing them with free equipment so all they, and their parents, need to do is turn up and enjoy themselves. “We just focus on making all the kids welcome,” Waters told Golf WA when the town, located about 75 kilometres east of Perth, hosted the Smarter Than Smoking Junior Tour earlier this year. “My focus is getting the kids who wouldn’t perhaps play another sport to come and play. They can come down and we have all the kit they need in our shed. “Golf is traditionally an elitist sport, memberships can be quite pricey and generally it has been the sphere of the wealthy and privileged. Families travel from as far as Quairading to take part in the club’s Saturday morning junior days – a round trip of 240 kilometres – and even plan their week around it. “Usually we try and get here all the time. We combine it with our big shop in Northam,” said Karen, the mother of one of the club’s juniors, who regularly makes the trip from Quairading in the relevant term times. It is a ringing endorsement of what Bakers Hill are doing and is hardly an isolated case with the club boasting 41 MyGolf junior members – a significant number for such a small town. “We draw on a really big area because they hear about our programme – we want kids to be welcome and not only learn golf skills but also life skills,” said Waters. 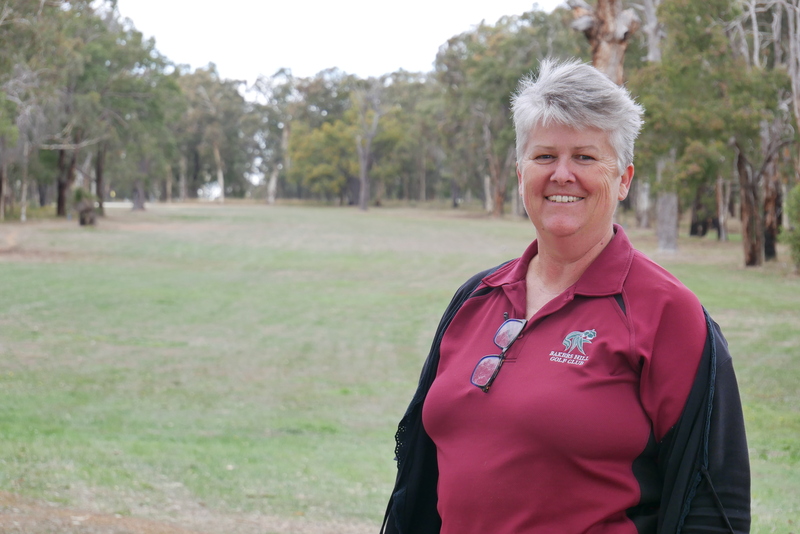 “We’ve had kids from Mundaring come up because there’s no junior golf down there. From Chidlow, Wooroloo, Wundowie to Clackline – we’ve had Northam kids come out when there wasn’t any juniors on there. The results are reward for the countless hours Waters and Cockman spend on the course either teaching – both have Community Coaching Accreditation – or in the clubhouse planning and generally providing the sort of support that is vital for grassroots sport to blossom. Their efforts are ably supported by the senior club – which paid for the shed that houses the the kids’ equipment. President Chris Harris has also helped supply that equipment from his Drummond Golf store in Cannington, in addition to donations from elsewhere. Last year Cockman celebrated 20 years of involvement with Bakers Hill’s junior programme, during which time he has worn many hats from co-ordinator to secretary and coach. “We made a great deal out of that and got him a prize,” said Waters, who has been involved for 12 years herself. Cockman moved to the area in the mid-1990s with his wife Karen and their two kids and within a year of joining as members he took over the running of the junior programme from Gordon Ashman, a patron of the senior club and who had been overseeing the junior programme for the 11 years previous after it was founded by Ed Whitely in 1979. “What I really love is teaching the kids – I suppose you’re not involved for 21 years unless you do,” said Cockman, who has moved to Roleystone but continues to make the trek over the hills. “There’s plenty to keep you busy with ups and downs. We had an influx of left-handed kids one year and so then we went and bought a heap of left-handed clubs – now we have no left-handers. Cockman still gets around Bakers Hill’s sand greens course himself when he finds the time, adding: “I got my handicap down to an 18 but now I’m back out to a 24 because my neck and back are stuffed! Cockman was therefore well credentialed to offer advice when kids from the Perth metro area were given the opportunity to play on Bakers Hill’s sand greens as part of the Smarter Than Smoking Junior Tour. “It’s sorted a few of them out,” said Cockman, who noted a lack of rain in the lead-up had left the sand soft, fluffy and hard to master. “If we had of had some rain these kids would really have to concentrate on chip and run – you have to pitch them about five or 10 metres short of the green. Chip and run on sand greens is pretty standard practice. The Smarter Than Smoking Junior Tour kids were given an introduction on how to play sand greens, and the etiquette of raking the sand before a putt, before they teed off from Marangaroo Golf Course head professional Rob Farley. Farley has established a link with clubs in the Avon Valley and regularly visits the region to provide coaching, which supplements the work being done by the likes of Waters and Cockman. Funding from the Western Australia Golf Foundation has helped Bakers Hills to pay for Farley’s added expertise and, just as vitally, free up Waters and Cockman to focus on delivering their innovative schedule of events that have proven so successful. “We try and make it fun – we even run a night golf programme,” Waters said. “We’ll have a sausage sizzle for all the family – we do a lot of family stuff – and then where it’s dark we have some fluro glow-in-the-dark sticks that we line the fairways with and we hang something off the flags. “We give all of the kids a glow-in-the-dark necklace so that they can’t get lost as well! We have the special balls that have the little glow in the dark insert. We get around 50 to come to that. Years of working with kids has taught Cockman and Waters what works, and what doesn’t, with that tried-and-trusted simple and effective philosophy the core of what they do. “When the children first come Dave and I run through the basics and try to get the kids out on the course because when children join a junior club they don’t want to come and do drills,” Waters said. “They want to come and play golf, but if you don’t teach them the basics they’re going to get frustrated very quickly and won’t continue playing golf to then improve their skills. “Rob will come down soon after that to help out – he’ll do two hours of teaching – and the parents can walk the course with the kids as they tee off from 100m and 150m. “It can be a bit chaotic getting 40 kids out on a nine-hole golf course and it becomes fairly congested, but we love it. :: MyGolf is the national junior programme that has the support of Western Australia’s LPGA Tour star Minjee Lee and former world number one Jason Day. To find out more about joining up, and where your nearest MyGolf centre is, click on this link.